EL HONORABLE AYUNTAMIENTO DEL MUNICIPIO DE SAN PEDRO CHOLULA, MEDIANTE SU COMITÉ MUNICIPAL DE ADJUDICACIONES, CONVOCA CON FUNDAMENTO EN LO DISPUESTO POR LOS ARTÍCULOS 115, FRACCIÓN II, B), FRACCIÓN III, INCISO C), Y 134 DE LA CONSTITUCIÓN POLÍTICA DE LOS ESTADOS UNIDOS MEXICANOS. EL ARTÍCULO 171 DE LA LEY ORGANICA MUNICIPAL , CON BASE EN LOS ARTÍCULOS 24, 25, 78 Y 79 DE LA LEY DE ADQUISICIONES ARRENDAMIENTOS Y SERVICIOS DEL SECTOR PUBLICO ESTATAL Y MUNICIPAL Y DEMÁS DISPOSICIONES RELATIVAS VIGENTES APLICABLES DE LA MATERIA. I EL COMITÉ MUNICIPAL DE ADJUDICACIONES DE SAN PEDRO CHOLULA 2011- 2014. 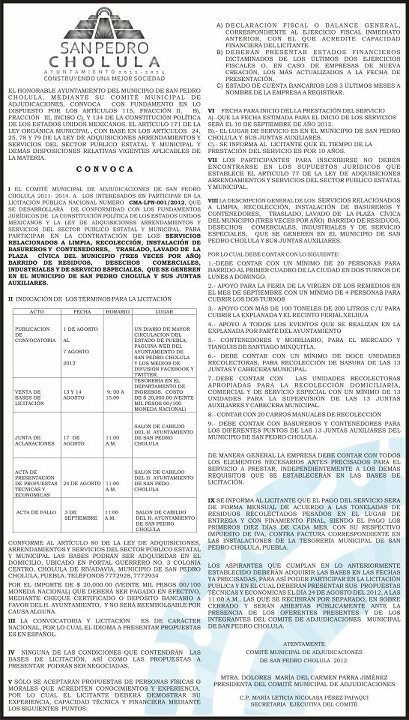 A LOS INTERESADOS EN PARTICIPAR EN LA LICITACIÓN PÚBLICA NACIONAL NUMERO CMA-LPN-001/2012, QUE SE DESARROLLARÁ DE CONFORMIDAD CON LOS FUNDAMENTOS JURÍDICOS DE LA CONSTITUCION POLITICA DE LOS ESTADOS UNIDOS MEXICANOS Y LA LEY DE ADQUISICIONES ARRENDAMIENTOS Y SERVICIOS DEL SECTOR PUBLICO ESTATAL Y MUNICIPAL. PARA PARTICIPAR EN LA CONTRATACIÓN DE LOS SERVICIOS RELACIONADOS A LIMPIA, RECOLECCIÓN, INSTALACIÓN DE BASUREROS Y CONTENEDORES, TRASLADO, LAVADO DE LA PLAZA CÍVICA DEL MUNICIPIO (TRES VECES POR AÑO) BARRIDO DE RESIDUOS, DESECHOS COMERCIALES, INDUSTRIALES Y DE SERVICIO ESPECIALES, QUE SE GENEREN EN EL MUNICIPIO DE SAN PEDRO CHOLULA Y SUS JUNTAS AUXILIARES. UN DIARIO DE MAYOR CIRCULACION DEL ESTADO DE PUEBLA, PAGINA WEB DEL AYUNTAMIENTO DE SAN PEDRO CHOLULA Y LOS MEDIOS DE DIFUSIÓN FACEBOOK Y TWITTER. TESORERIA EN EL DEPARTAMENTO DE INGRESOS. POR EL IMPORTE DE $ 20,000.00 (VEINTE MIL PESOS 00/100 MONEDA NACIONAL) QUE DEBERÁ SER PAGADO EN EFECTIVO, MEDIANTE CHEQUE CERTIFICADO O DEPÓSITO BANCARIO A FAVOR DEL H. AYUNTAMIENTO, Y NO SERÁ REEMBOLSABLE POR CAUSA ALGUNA. III LA CONVOCATORIA Y LICITACIÓN ES DE CARÁCTER NACIONAL, POR LO CUAL EL IDIOMA A PRESENTAR PROPUESTAS ES EN ESPAÑOL. IV NINGUNA DE LAS CONDICIONES QUE CONTENDRAN LAS BASES DE LICITACION, ASÍ COMO LAS PROPUESTAS A PRESENTAR PODRAN SER NEGOCIADAS. A) DECLARACIÓN FISCAL O BALANCE GENERAL, CORRESPONDIENTE AL EJERCICIO FISCAL INMEDIATO ANTERIOR, CON EL QUE ACREDITE CAPACIDAD FINANCIERA DEL LICITANTE. B) DEBERÁN PRESENTAR ESTADOS FINANCIEROS DICTAMINADOS DE LOS ÚLTIMOS DOS EJERCICIOS FISCALES O, EN CASO DE EMPRESAS DE NUEVA CREACIÓN, LOS MÁS ACTUALIZADOS A LA FECHA DE PRESENTACIÓN. C) ESTADO DE CUENTA BANCARIOS LOS 3 ULTIMOS MESES A NOMBRE DE LA EMPRESA A REGISTRAR. A).-QUE LA FECHA ESTIMADA PARA EL INICIO DE LOS SERVICOS SERÁ EL 10 DE SEPTIEMBRE DE AÑO 2012. 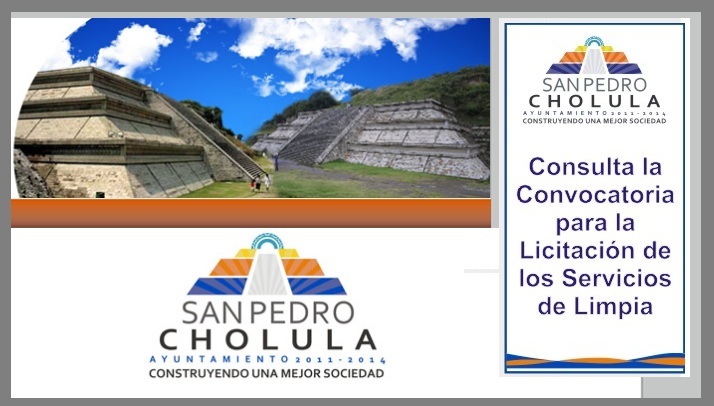 B).- EL LUGAR DE SERVICIO ES EN EL MUNICIPIO DE SAN PEDRO CHOLULA Y SUS JUNTAS AUXILIARES. C).- SE INFORMA AL LICITANTE QUE EL TIEMPO DE LA PRESTACIÓN DEL SERVICIO ES POR 10 AÑOS. VII LOS PARTICIPANTES PARA INSCRIBIRSE NO DEBEN ENCONTRARSE EN LOS SUPUESTOS JURIDICOS QUE ESTABLECE EL ARTICULO 77 DE LA LEY DE ADQUISICIONES ARRENDAMIENTOS Y SERVICIOS DEL SECTOR PUBLICO ESTATAL Y MUNICIPAL. VIII.- LA DESCRIPCION GENERAL DE LOS SERVICIOS RELACIONADOS A LIMPIA, RECOLECCIÓN, INSTALACIÓN DE BASUREROS Y CONTENEDORES, TRASLADO, LAVADO DE LA PLAZA CÍVICA DEL MUNICIPIO (TRES VECES POR AÑO) BARRIDO DE RESIDUOS, DESECHOS COMERCIALES, INDUSTRIALES Y DE SERVICIO ESPECIALES, QUE SE GENEREN EN EL MUNICIPIO DE SAN PEDRO CHOLULA Y SUS JUNTAS AUXILIARES. 1.-DEBE CONTAR CON UN MÍNIMO DE 20 PERSONAS PARA BARRIDO AL PRIMER CUADRO DE LA CIUDAD EN DOS TURNOS DE LUNES A DOMINGO. 5.- CONTENEDORES Y MOBILIARIO, PARA EL MERCADO Y TIANGUIS DE SANTIAGO MIXQUITLA. 6.- DEBE CONTAR CON UN MÍNIMO DE DOCE UNIDADES RECOLECTORAS, PARA RECOLECCIÓN DE BASURA DE LAS 13 JUNTAS Y CABECERA MUNICIPAL. 7.-DEBE CONTAR CON LAS UNIDADES RECOLECTORAS APROPIADAS PARA LA RECOLECCIÓN DOMICILIARIA, COMERCIAL Y DE SERVICIO ESPECIAL CON UN MÍNIMO DE 13 UNIDADES PARA LA SUPERVISIÓN DE LAS 13 JUNTAS AUXILIARES Y CABECERA MUNICIPAL. 9.- DEBE CONTAR CON BASUREROS Y CONTENEDORES PARA LOS DIFERENTES PUNTOS DE LAS 13 JUNTAS AUXILIARES DEL MUNICIPIO DE SAN PEDRO CHOLULA. DE MANERA GENERAL LA EMPRESA DEBE CONTAR CON TODOS LOS ELEMENTOS NECESARIOS ANTES PRECISADOS PARA EL SERVICIO A PRESTAR, INDEPENDIENTEMENTE A LOS DEMAS REQUISITOS QUE SE ESTABLECERAN EN LAS BASES DE LICITACIÓN. IX SE INFORMA AL LICITANTE QUE EL PAGO DEL SERVICIO SERA DE FORMA MENSUAL DE ACUERDO A LAS TONELADAS DE RESIDUOS RECOLECTADOS PESADOS EN EL LUGAR DE ENTREGA Y CON FINAMIENTO FINAL, SIENDO EL PAGO LOS PRIMEROS DIEZ DÍAS DE CADA MES, CON SU RESPECTIVO IMPUESTO DE IVA, CONTRA FACTURA CORRESPONDIENTE EN LAS INSTALACIONES DE LA TESORERÍA MUNICIPAL DE SAN PEDRO CHOLULA, PUEBLA. LOS ASPIRANTES QUE CUMPLAN EN LO ANTERIORMENTE ESTABLECIDO DEBERAN ADQUIRIR LAS BASES EN LAS FECHAS YA PRECISADAS, PARA ASÍ PODER PARTICIPAR EN LA LICITACIÓN PUBLICA Y EN EL CUAL DEBERÁN PRESENTAR SUS PROPUESTAS TÉCNICAS Y ECONÓMICAS EL DIA 24 DE AGOSTO DEL 2012, A LAS 11:00 A.M., LAS QUE SE RECIBIRÁN POR SEPARADO, EN SOBRE CERRADO Y SERÁN ABIERTAS PÚBLICAMENTE ANTE LA PRESENCIA DE LOS OFERENTES PRESENTES Y DE LOS INTEGRANTES DEL COMITÉ DE ADJUDICACIONES MUNICIPAL DE SAN PEDRO CHOLULA. COMITÉ MUNICIPAL DE ADJUDICACIONES DE SAN PEDRO CHOLULA 2012.